won the war, would dismantle wartime economic planning? How many other peoples’ predictions from those years have panned out? At that time, Hayek’s worries were perfectly justified. 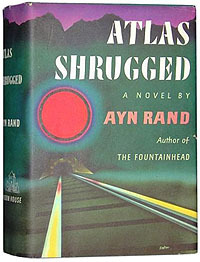 On a completely unrelated subject, this is one of the things that’s always struck me as so peculiar about Atlas Shrugged. If it had been published in 1937, it would have made a kind of sense. Capitalism was on the ropes, there were lots of serious adherents of central planning, and the NRA was a pretty good example of the kind of law that Rand condemns in her novel. Likewise, even if it had been published in 1947, it might have made a bit of sense in an extravagant sort of way. As Tyler notes, it was unclear how the postwar economy would pan out, lots of people assumed that wartime planning would make the transition to peace, and communist parties in Europe were, at the time, very active and very successful. But it was published in 1957, and even aside from its train-themed plot it seems wildly out of tune with its times. The United States was firmly capitalist, the New Deal had settled down into a quiet adolescence, the country was rabidly anti-Soviet and anti-communist, and celebration of big business leaders was the order of the day. Hayek at least had the excuse of writing his book in the early 40s and publishing it in 1944, when it might have been an over-the-top but still understandable attempt to warn against continuing wartime planning and socialist control of industry after the war was over. But Rand took a decade to write her book and apparently did nothing to make it relevant to its eventual time. And so it feels like an antique. But hey — it’s sold a bazillion copies or so and continues to resonate with a certain kind of temperament to this day. So who am I to criticize? And maybe its antiquarian timelessness is part of its appeal. I guess no matter what era you live in, the veneer of capitalism is always thin and the looters are never more than a snail darter away from taking over society.